Our new spy photographs reveal the 2015 Audi Q7, the replacement for the enormous seven-seater SUV at the top of Audi’s SUV family tree. As reported last week, the next Audi Q7 will be joined by a new Q8 model as Ingolstadt aims to broaden its range of 4x4s to capitalise on the world’s never-ending appetite for taller, more versatile cars. These photos are the first proof that Audi will follow a well-worn route with its new 2015 Q7. Although this full-sized SUV can prove too big for Britain’s crowded city roads, don’t forget it is aimed at markets where big is beautiful, such as the US and more rugged eastern markets. Expect three rows of seats to be offered again. The new Audi Q7 is based on the VW Group’s new MLBevo architecture, which means it shares hardware with the new Bentley ‘Falcon’ SUV and future Porsche/VW SUVs. The Q7 is unique, in the UK market at least, in offering no petrol engines at all: 100% of Q7s sold here are diesel, and that is likely to continue with the new model. The new Q7 will be offered in plug-in hybrid (PHEV) guise - for export in combination with a petrol-fed V6 and, for Europe, with a V6 TDI. It means that the gigantic Q7 will be able to assuage some of the urban guilt by creeping along silently for short bursts on the school run. The big news with the next-generation Q7 is the expansion of the range to include a new Q8 model. Following the success of Audi’s (and now BMW’s) odd- and even-number range strategy, we can now expect a more dynamic range of SUVs sporting even numbers. Due in 2017, the new Q8 promises to be the most prestigious addition to the Q theme park. Why a Q8 and not a Q9? Why a Q flagship and not an A9? Because the Q8 is claimed to find about four times as many takers as a top-of-the-line coupe, and because Audi needs a weapon to fend off the next Mercedes-Benz GL and the upcoming BMW X7. 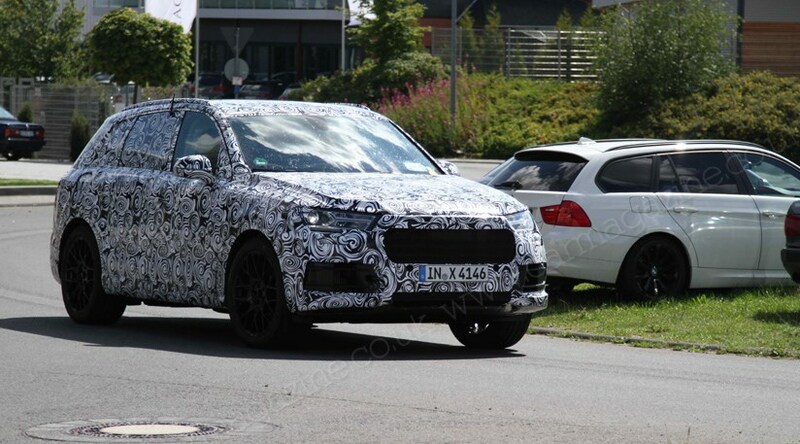 For 2016/2018, the crystal ball is showing two emphatically sporty SQ7/SQ8 bahnstormers, powered by a brawny 408bhp/664lb ft V8, plus the brand-new 5.0-litre V10 TDI Ferdinand Piech has reportedly taken a personal interest in.